Northwest Group...A Xerox Company: So What Really Is Business Process Automation? So What Really Is Business Process Automation? You may start to hear the term "Business Process Automation" circulating - So what is it exactly? Gartner defines it as "the automation of complex business processes and functions beyond conventional data manipulation and record-keeping activities, usually through the use of advanced technologies." Really, the goal of most business software is to take tedious processes and convert them into a push-button workflow that takes the manual out of manual labor. Because logging into a website to approve some invoices instead of Jim chasing after you every afternoon for a signature sounds a little easier... on everyone. in a nice convenient digital file cabinet that contains all the business process workflow for each document? 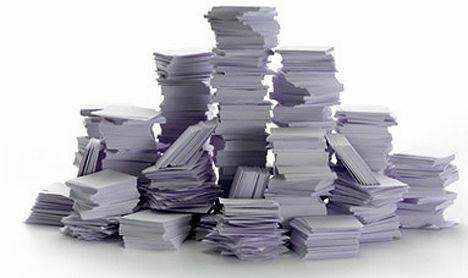 For instance, your job is to take your stack of paper, review each sheet, sort them into the appropriate stacks, have each of the four managers approve their stack in a timely (and I stress timely) fashion, then be able to track down those invoices, new hire packets or expense reports (whatever makes up your "stack of paper") at any given moment. You might have a tear running down your cheek right now as you imagine yourself in the file room with drawers of file cabinets ripped open and you sprawled out on the floor going through yellow folder after yellow folder (who decided on that shade of yellow anyway?) looking for that one page, only to be interrupted 50 times for things that are possibly more important but that must take a back seat until you can find that one... wait... there it is! If this sounds familiar, I think we can help...well I know we can help. Business Process Automation isn't just a new trendy term, it is in fact real and we know all about it. So wipe those tears away and let us know when you are ready to make it a reality. We are here waiting!